Drones – or unmanned aerial vehicles (UAVs) – have recently been in the headlines for the wrong reasons, following a series of incidents calling into question their safety when operating around other aircraft. Probably the most high-profile of these took place at the end of March, when Prince William’s air ambulance was, according to a report by the UK Airprox Board, a whisker away from a collision with a drone while flying at 1,900 feet. Another close call, meanwhile, took place in January, 500 feet over a primary school, as a DH8 turboprop came in to land at Birmingham Airport. While there is nothing to suggest that either of these near-collisions was malicious in origin, they do indicate UAVs’ potential to inflict damage, especially if operated by a hostile agent. The question is, just how serious is the threat? And what is the best way to mitigate any danger that may exist – for instance, if a drone attack were launched on a UK airport or other high-security site? Dr Dave Sloggett is one of the UK’s leading authorities on terrorism, with a CV including advisory work with the British government and NATO. He has also written a number of books on aerial warfare, and most recently on the use of drones in combat. “The threat from drones to civilian sites is real,” says Sloggett, “and not just in relation to airports. There have also been a lot of sightings of UAVs over port facilities, for instance, as well as other examples of what we might term ‘critical national infrastructure’. While the prospect of a drone careering at high speed into a passenger aircraft isn’t something that exactly pleases anyone, according to Sloggett the main concern on the part of the UK authorities is the technology’s potential use as a means of reconnaissance. While he can’t go into specifics, Sloggett is happy to give an example of just the kind of situation where someone could be using a drone with an integrated camera to collect information. This of course could just be a – frankly rather thoughtless – boat-obsessed member of the public, or potentially something more sinister. He continues: “I know the security manager of a UK port, and they regularly see a drone flying over the top. In every instance, the port contacts the police and officers mobilise, but they’re rarely able to find whoever’s operating it. “As well as people who mean us harm, there are also a lot of pranksters out there who, frankly, are just being thick and ignoring the rules about how close you can fly to things like airports. These are quite clear, and commercial UAVs are supposed to have mechanisms which warn users that these locations are nearby. My sense is this isn’t as strictly enforced as it might be, particularly if the operator has been able to turn off the GPS. While drones have been used by the military for a number of years, the technology is only now starting to become more widely available to the public. With that in mind, it is probably no surprise that UAV-related legislation is still in its comparative infancy, with current UK guidelines probably best summed up by the tenets of the Civil Aviation Authority’s memorably titled Drone Code. (Eg, don’t fly near airports or aircraft; stay below 400 feet; and keep well away from people or property, and so on). While this area of law seems to be progressing fairly tentatively, the development of anti-drone technology itself is gathering speed. Mark Radford, CEO of Blighter Surveillance Systems – whose radar tech is used by the US military as part of the integrated AUDS anti-drone solution – gives an overview of the solutions currently available to those wishing to incapacitate a UAV. “Ultimately, it all depends on what you want and what the environment is,” he says. “If you were a security manager at an airport, for instance, you’d have a very different view of the threat compared with a soldier at a forward operating base, or someone in charge of a nuclear power station. Another area of the market, according to Radford, is those who require more “tactical” devices, such as single-purpose sensors and the “effectors” which can be used along with them. The latter include handheld jamming guns, net-throwing devices, counter-drone drones, and so on. An example of the recent use of this kind of ‘tactical’ solution occurred at this year’s Boston Marathon, where the city’s police employed a range of different technologies as a prevention measure. 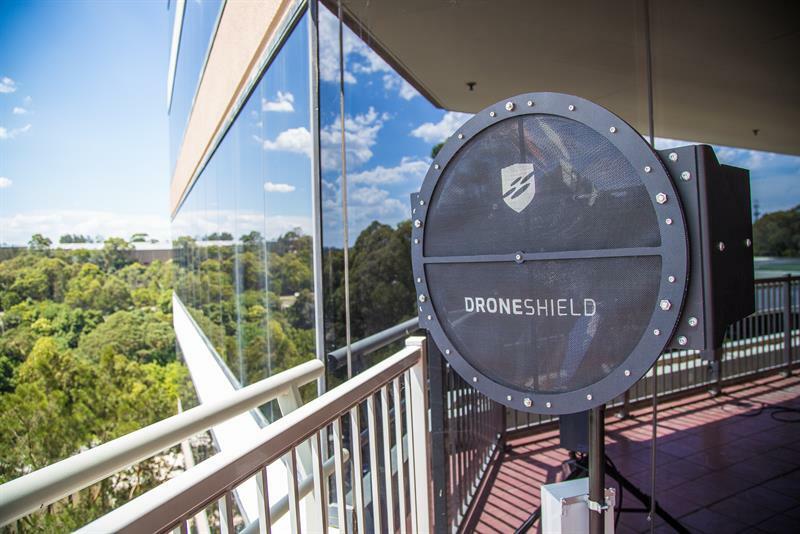 These included a pair of tethered drones designed to avert terror attacks on the ground, as well as acoustic detection sensors produced by US-based company DroneShield to help create a ‘no drone zone’. That these measures were put in place in Boston on marathon day makes sense, given the horrific events in 2013 when terrorists used the race as an opportunity to kill three people and injure several hundred others. The deployment also demonstrates how seriously drones are now being taken, whether as a nuisance or legitimate security threat. Drones are arguably the most exciting, yet at the same time potentially troublesome, technology currently in the public safety/high-security conversation. On the one hand, they provide massive opportunities for air support; for instance, should the emergency services need to operate in an area considered too risky to deploy personnel. On the other hand, meanwhile, if used to their full potential by hostile agents, they represent an unprecedented risk in terms of gaining access to potentially vulnerable or sensitive environments. According to Sloggett, however, there is a considerable way to go before a weaponised civilian drone poses any real risk to security. “For my money, to be able to load a drone with explosives and then crash it into an aircraft landing at a typical speed of 150 knots… you’d have to be very lucky,” he says. “It’s not impossible, but it would require a considerable level of skill. “In terms of the development of the threat, one thing we were worried about, particularly during the London Olympics, was that someone would find a way of dispensing chemicals using a kind of crop duster UAV. One emerging capability of drones is the ability to ‘swarm’ – that is, operate as part of a large number of devices, flying in formation to inflict havoc. Given how far forward both the US and the Chinese appear to be in terms of developing this capability for their respective militaries, could this be an issue? “To be honest, I really don’t think so,” says Sloggett. “It may be something for the future, but that’s light years ahead from where we are at the moment. The reality in Iraq and Syria is that you get about two attacks a day using improvised devices: barely flyable, knocked together in very dirty workshops. This, clearly, is good news – particularly also taking into account Sloggett’s assertion that a drone without a payload of explosives could probably achieve very little in terms of damage to an aircraft anyway. The other reason for a certain level of relief, however, is that currently there appears to be very little that civilian operators can do about the threat other than detect it. Again, we’ll see where this area of legislation develops in parallel with the technology. The issue, according to the Civil Aviation Authority, is that airports – not unreasonably – are hamstrung by the need to avoid disrupting their own business-as-usual operations, as anti-drone radio signals could potentially interfere with ground and ground-to-air communications, radar, and instrument landing systems signals.